Felt (the club on Washington Street in Downtown Crossing) is holding the first ever Miss Boston Competition and it starts this weekend. The event will take place over the next three Saturdays (starting 6/14). Felt Boston is producing and hosting the first ever Miss Boston 2008 Model Search. 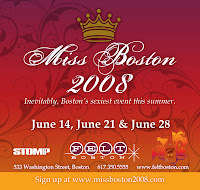 This three-week competition will give a beautiful, talented, and young Bostonian the opportunity to be crowned “Miss Boston 2008” with exciting modeling and exposure opportunities. The competition is dedicated to finding the ultimate local model to be the face of Boston for 2008. Click (here) to go to the site and register. 0 Response to "1st Ever Miss Boston Competition - 6/14"